As for snacks and meals, I'll be making some scones and tea in the morning as usual and I'll be putting a huge pork roast into the slow cooker for bbq pulled pork sandwiches for dinner. I'm pretty sure we're all set for snacks (for the next month). And yes, I bought a pineapple. I'm not sure how many updates I'll post here on the blog but I will definitely be on Twitter and Instagram all day long so come find me! I think I'll aim to stay up until about 2:00am. I think that's usually the point that my mind starts melting a bit. I'm also one of the sponsors of a giveaway (any book up to $15 from the Book Depository), an international Angel (I'll help a US giveaway book get to an international winner), and a rogue cheerleader on #teamrogue. Why yes, I do love the Read-a-Thon something fierce! It's my favorite excuse to read a small stack of books, eat junk food and talk books with you lovely people all day long. Finally, thank you so much to Andi and Heather for coordinating this wonderful event. It gets better each time thanks to your dedication. 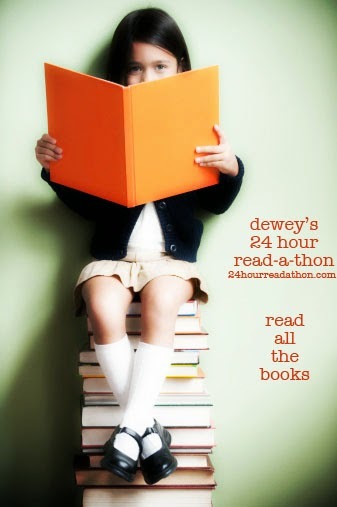 I never had the chance to meet Dewey but I can tell that her reading spirit is alive and well through this event. I've heard so many great things about Queen Victoria's Book of Spells! Same goes with The Aviary. Happy reading!! Your pile looks great, and so do your snacks! I've not read any of those books apart from Ramona and I haven't heard of any of them either so I'll be interested to hear what you think... one of the best things about the readathon is getting recs. Have a good day! I know, his stories are so easy to read and yet so delightfully complex and intriguing. Thank you so much, and you too! Hope you are having a super fun read-a-thon! I LOVED Escape from Mr. Lemoncello's Library and my husband is reading it now! Another Seattle book blogger- I love it! And you got up at 5am! Well done you. I did not make it up that early but am hoping I can make the finish.